Frankie has been adopted by his foster mom. 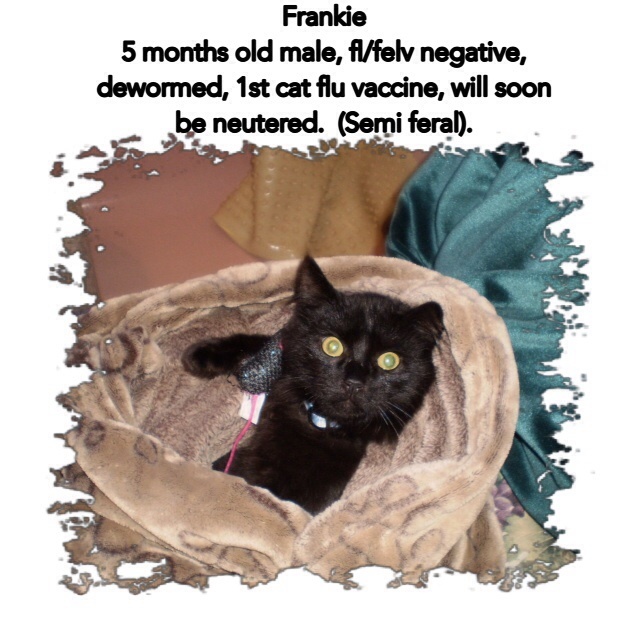 Frankie is now neutered and fully vaccinated against the cat flu, dewormed and fl/felv negative. Frankie is one of 4 feral cats recently rescued. He and his brothers were likely born outside as they were feral (not tame). Frankie’s 2 brothers and his Momma have found their wonderful furever homes, Frankie is waiting patiently. Frankie isn’t much of a cuddler yet. But he does enjoy being talked to, played with, brushed and having time spent with him. He may never really enjoy being picked up, but there are non feral cats who aren’t fussy about the trappings of a good cuddle. We are sure though in time he will be a faithful companion. If you are interested in adopting Frankie please email us at centralpaws@yahoo.ca us for an application.